Trent "The Car Guy" is the #1 Rated Sales Rep in the United States by DealerRater! Born and raised in Ohio and joined the US ARMY when he turned 17 years old and served as Military Police. After the military, Trent moved to Tucson, AZ and unexpectedly was recruited into the car business. 7 years later, he married Jacquelene, a registered nurse. 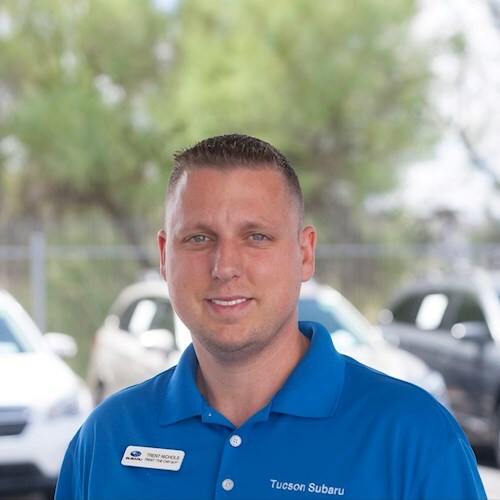 The day after returning from their honeymoon, Trent began a new chapter in his career at Tucson Subaru. In 2015, Trent and his wife welcomed their 1st child into the world... Kennedy Grace. The Car Guy has opened up great opportunities for Trent and his wife to be involved with and to give back to many different organizations including Blessings in a Backpack, Look Save a Life, Amphi Foundation, Leukemia & Lymphoma Society, Community Food Bank, Cody's Friends any many others. He has volunteered his time with Big Brothers Big Sisters of Tucson and traveled to Mexico multiple times to build homes with Calvary Chapel Tucson and Casa De Amor. His faith in Jesus Christ is the foundation of his entire life. When not working as an Automotive Consultant, Trent loves camping, being outdoors, off-roading, watching the Buckeyes and anything that involves "geeking out" building websites, editing videos, and social media marketing.